★ Charm Size: 1/4" x 1-1/4"
Photo is not to scale and may appear larger to show detail. Refer to exact measurements above. Bead has a diameter that will allow it to fit almost any chain, cord, snake chain or bracelet that accepts beads and has one end that screws off. Not affiliated with Pandora or any other trademarked jewelry. Gift boxes are available at no additional cost and can be added from the drop-down menu during checkout. You can mark it as a gift, add a gift message, and send it directly to a recipient by entering their address in the 'shipping address' during checkout. Receipts with price information are not included with orders that are gifts. Shipping costs are combined when more than one item is ordered. All orders ship from Pennsylvania via USPS First Class Mail, USPS Priority Mail or Express Mail. USPS First Class is the default shipping method but you can upgrade your shipping during checkout. All international orders shipping outside of USA are shipped via USPS First Class International Mail. Get 10% off your order when you spend $35 at this shop. Discount shown at checkout. Do your charms fit on Pandora? YES. My dangle bead charms and large hole beads fit on all major brand European style bracelets, including Pandora. 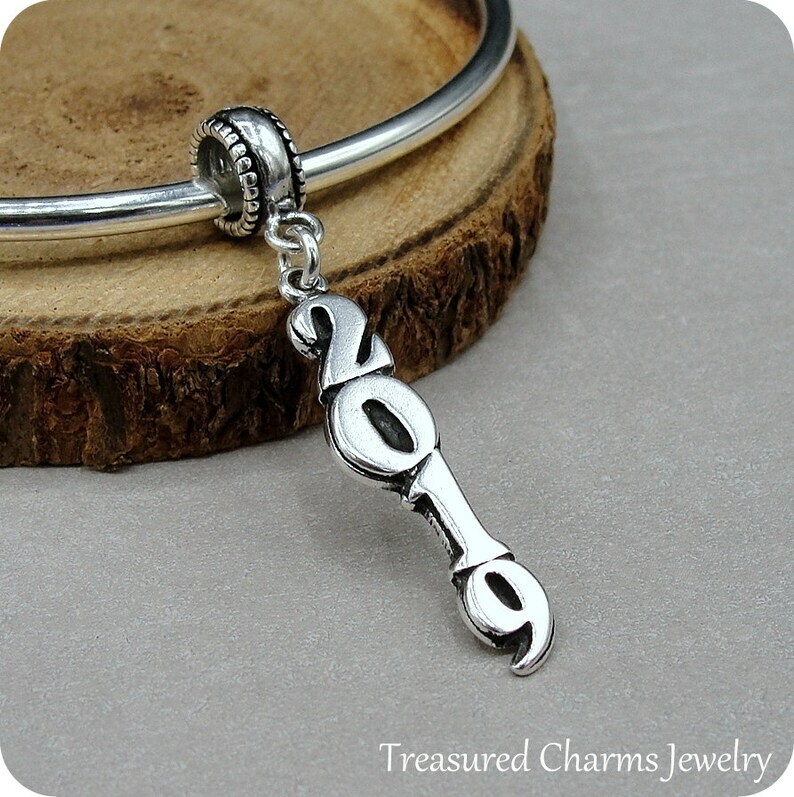 If you see a charm in my shop that is not on a dangle bead, you can have one added by selecting 'charm on euro bead' from the charm options drop-down menu before adding it to your shopping cart. Since these beads are universal (they fit many different bracelets and necklace chains), the bead hole is not threaded and may be slightly larger than an authentic Pandora bead. In order to keep your dangle bead charm in place on your bracelet you will need to place it between other threaded charms or stoppers. I don't need a chain. Can I purchase just the charm? YES. All of the products in my shop are available with a necklace chain or as a stand-alone charm on a circle jump-ring. Before adding the item to your cart there is a drop-down menu where you can choose to purchase just the charm. You will also find options to add a clasp or European bead to fit a Pandora bracelet. Can I order in bulk and receive wholesale pricing? My sales are primarily retail but I can do special orders on some items and work out a discount. Usually 15-20% off orders over $100 of the same item. Please contact me for more information. How can I send an item as a gift directly to the recipient? When checking out, use the recipients address as the shipping address. If you want a gift note added to it so the recipient knows who it is coming from, leave the message in the 'note to treasuredcharms' box during checkout. Gift notes are printed on card-stock at included in the gift box. I am sending at item as a gift. Can you leave out the receipt? I do not include receipts or packing slips with any orders regardless of whether they are a gift or not. If you need a receipt, you can print one from your Etsy purchase history or send me a message and I'll email you a PDF receipt. Do you combine shipping if I buy more than one item? YES. Shipping is one flat rate regardless of how much you purchase. As you add items to your shopping cart, you will see that shipping is only charged on the first item in your cart. How long will it take for my order to ship and when will I receive it? Orders ship within 24 hours or 1-business day Mon-Fri. I do not ship on Saturday's except during the holiday season. Since I ship worldwide shipping times vary greatly. In the USA expect your order to arrive in 3-5 business days with standard shipping, 2-3 business days with Priority shipping and 1-2 business days with Express shipping. For all orders outside of USA, please allow 7-14 business days or longer. Can you overnight an order to me and much would it cost? For USA orders, I can overnight to some locations if the order is placed by 12pm EST. Please contact me with your shipping zip code BEFORE placing the order so I can confirm whether it can get there overnight or not. The cost of USPS Express Shipping is $20.95.